Runners talk about their shoes with great enthusiasm and I often overhear, “My shoes are the best ever! You should try a pair of these!” The question is: what is the best shoe for you? To get at this answer we need to look at the different types of shoes, how shoes are manufactured, and how your current shoes have been performing over time. Styles, manufacturing methods, and new materials continuously evolve. Your trusty, go-to shoe model gets changed, leading to adaptations in fit and your running gait, setting the stage for injury. 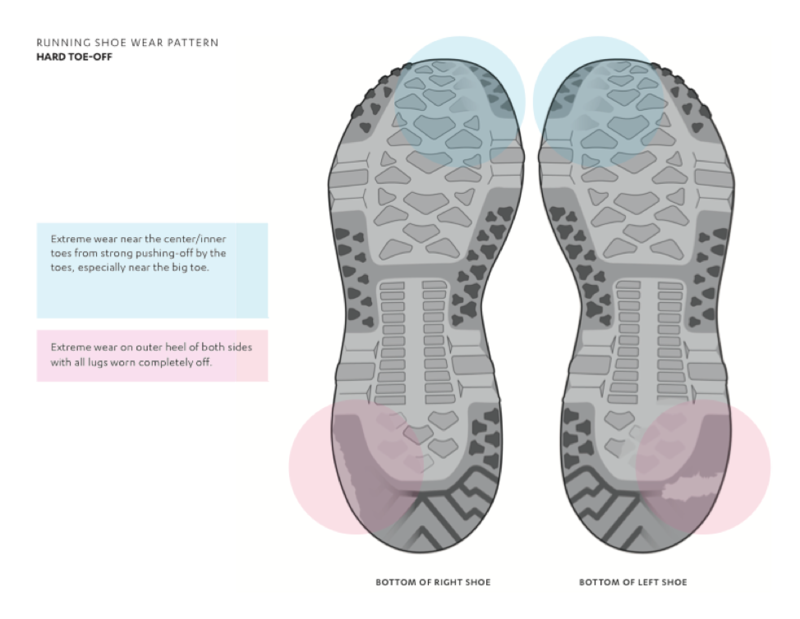 In this article I’ll show you how to look at the wear pattern on your shoes and how to use that information when evaluating your running injury. We will also look at the major types of running shoes. Before we get started, you should know there is conflicting research and conclusions about how the selection of specific running shoes affects injury rates. The following is my opinion, based in my years of experience as a running injury prevention specialist, and runner for the past 49 years. Fitting a type of shoe with a foot shape has been under scrutiny by the scientific community. Having said that, there seems to be a general consensus to fit flat feet with a motion control shoe, slightly low arches with a stability shoe, medium and high arches with a cushion shoe and short distance running with a minimalist shoe. If you are relatively new runner this basic rule of thumb is a good place to start. If you are an experienced runner, you can use my shoe analysis method below to decide on the best shoe. These shoes have a thin sole, low weight, and little, if any, arch support. There is no attempt at controlling pronation or how your foot functions, allowing you to use your own natural movements. Most minimalist shoes attempt to mimic bare feet, with only a thin sole. There is no drop or elevated heel in these shoes. They are more of a specialty shoe used with the premise that barefoot running is best. This shoe has a thicker mid sole than a minimalist shoe and have a cushy feel to them and give you a soft ride. They tend to have no hard shell inside the heel. They are typically used for high arches and “supination” (rolling to the outside of the foot). They are lightweight and flexible, but not as flexible as a minimalist. This seems to be the most common type of running shoe for new runners. There is substantially more support in the mid-sole and there is often a hard plastic shank that prevents overpronation. The mid-sole usually has at least two densities with different colors. The heel is reinforced to control the position of the foot during heel strike. The assumption here is that the runner is probably “pronating” (rolling the foot in) too much during the gait cycle. These shoes also tend to have a hard internal heel shell. They weigh more and are stiffer than a cushion shoe. These shoes have straight last, meaning there is no curve in the sole where the longitudinal arch (that’s just your arch) is located. These shoes are made for runners with flat feet and are heavier than other shoe types. They are not flexible, have a hard heel shell, and the rear foot is heavily reinforced to prevent pronation. Shoes used to be easier to identify by the shape of the last—that’s the shape of the shoe when you are looking at the sole. Evolving materials and manufacturing techniques have blurred the lines between shoe models, sometimes making it difficult to know which is which. A shoe with large “stack height” can be confused with motion control shoes. Stack height is just the overall thickness of the midsole. Although a large stack height makes the shoe appear more stiff, this may not actually be the case. Hoka brand (see picture below) makes shoes with big stack height and a distinctive look. They are popular with trail runners because of the extra cushion that protects feet from rocks or other irregularities on the trails. They also make road running shoes and have a soft ride. There are many more details about running shoes, mostly known by retailers and manufacturers. What is written here is good enough to get you started. If you really want to get into the weeds about this subject, visit the sales force at the local running shoe store on a slow day and you’ll get a fascinating education in the nerdology of shoes. Now that we have looked at shoe types, let’s take a look at how they can affect your running gait. If you stand on the outside of your feet and do several squats, you’ll notice that most of the muscle activity is exerted on the outer muscles of your lower legs, thighs, and gluteal muscles. Now try doing this same squat while standing on a single leg. This is a simple way to mimic what happens when you are running and will spotlight which muscles you are activating during the gait cycle. This type of gait is called supination and leaves a distinct wear pattern on your shoes, with the wear pattern along the outer edges of the soles. Runners with supination gait will need to change their shoes about three times as often as other wear patterns. Now stand with your feet rolled slightly inward and you’ll notice there is more stress on the arches, Achilles, inside of the thigh and knees. Now try this position on a single leg to mimic your running gait. You’ll probably have to put your hand on a steady object to stabilize during while doing squats in this position. If you run in this position, you are a pronator. This is the most common type of runner. Neither of supination or pronated wear patterns are bad, nor are they necessarily good. 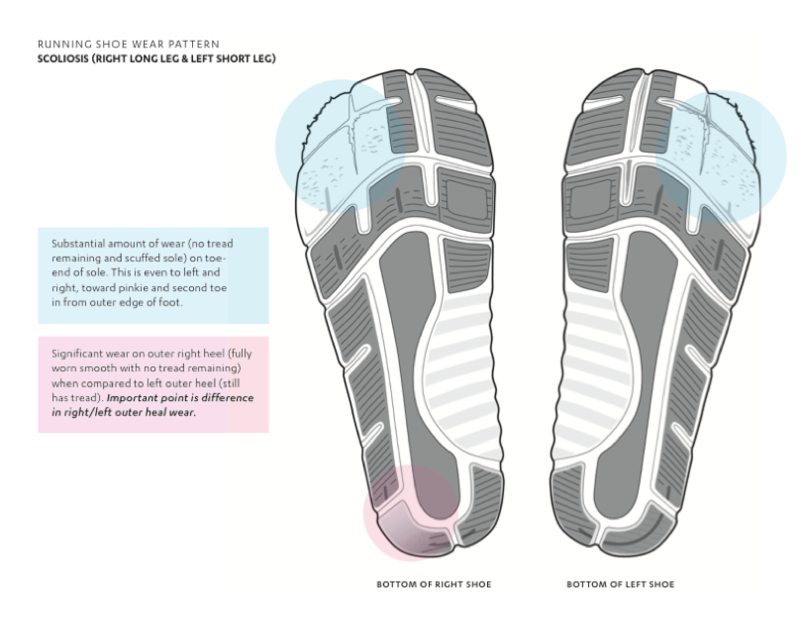 The wear patterns simply tell you where the stress is being applied to your feet and where the greatest stress is being applied to your gait muscles when you are running. 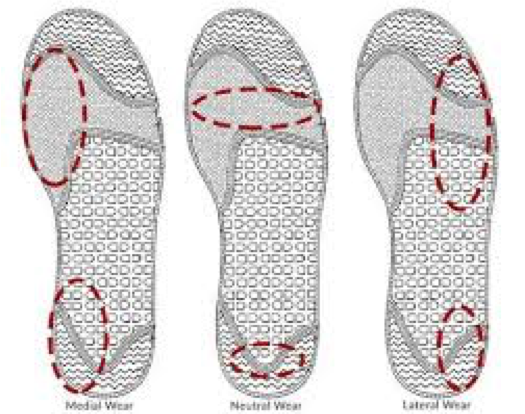 If your shoe wears in the outer heel and middle of the metatarsal area, you are a neutral pattern. Keep doing what you are doing. Thanks for the info, Doc. Now what? Here’s how you can use this information to help solve running problems. Let’s say you are having trouble with the outer aspect of your knees and your sports doctor, physical therapist, or chiropractor says you have Iliotibial band syndrome. 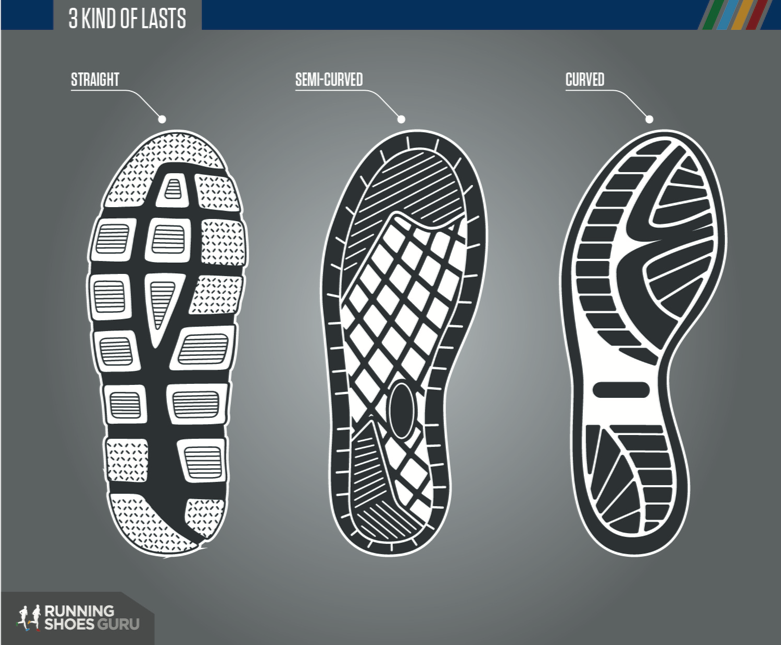 Your shoe wear pattern tells you that you have been running on the outer soles of your shoes. You are running on stability shoes, which tend to cause you to run on the outer soles. If you continue to place stress on the outer sole and load the outside of your knees, you are not going to get better, your problem will likely worsen and may even have been caused by your stability shoes. It’s time to change to a shoe with less control, a cushion shoe. If you have been running in motion control shoes, then go to the shoe with the next least control, a stability shoe. This next scenario is the opposite. You have pain in your shins and are running in a cushion shoe. You can help by offloading some of the stress on the muscles of the medial lower leg by putting in more arch support and controlling overpronation, use a stability shoe. In other words, try to control where you load your gait muscles with shoe selection. As a general rule, I use less and less control the longer a runner has been running. An experienced runner needs less support in their feet as they become stronger and more efficient in their gait. In most cases, a cushion shoe works best. Look at your shoes to determine where you have been striking. Change to a shoe with less control when you have pain on the outer part of the legs and glutes. Change to a shoe with more control when there is pain in the arches, shins, calves, and inner knees. This is a practical approach which has solved many running injuries over the years. It works most of the time, not always. I always warn a runner when I recommend these changes that we are taking risk that might not work out. The risk is that they might wind up with a pair of expensive running shoes that didn’t solve the issue. If you work with a high quality, specialty running shoe store, they understand the challenges of fit and function and often have great return policies that let you try them out for a few days.